So that we can fulfil both your and our high demands, quality is subjected to continuous inhouse control over the entire process stream – from incoming goods to shipping. Consistent adherence to our high quality standard is ensured by our DIN EN ISO 9001:2008 quality management system and audited regularly. 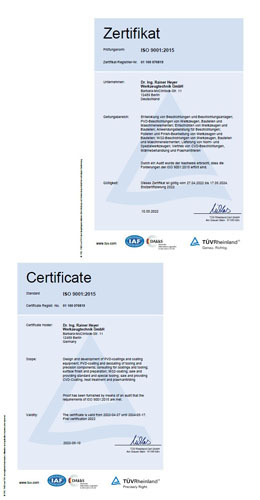 Moreover, its currency and validity can be verified in the DQS certification database. It is our constant endeavour to improve our quality by maintaining and advancing our QMS and hence consolidating the foundation for our company’s development. We would be pleased to provide our interested parties with our quality policy on request.